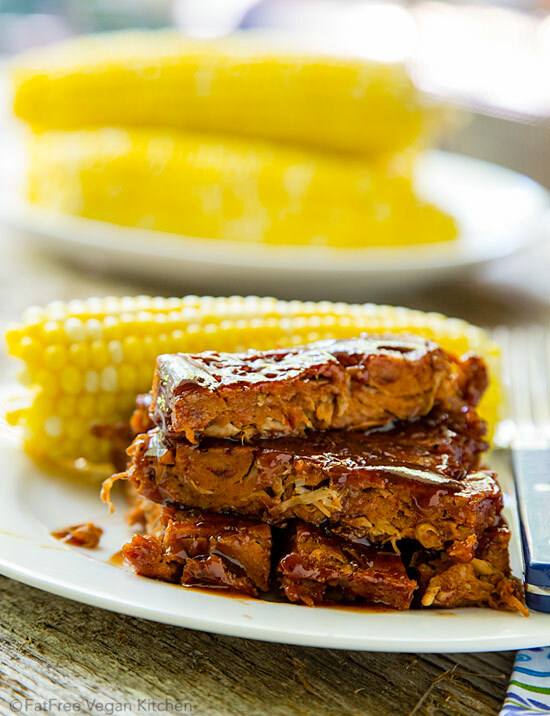 Jackfruit adds moisture and a pull-apart texture to these incredible seitan-based vegan ribs. No one will believe they are fat-free! 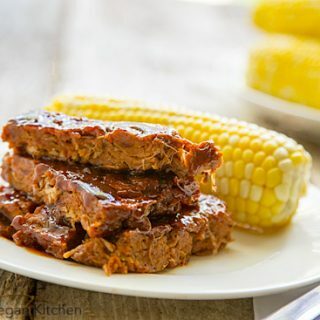 I wish I had an interesting story behind this recipe, but the truth is, I saw a photo by Lacey, the blogger at Avocados and Ales, of seitan-jackfruit ribs in the very popular Facebook group “What Fat Vegans Eat” and just had to have some. The texture looked so realistically “meaty” that almost as many of the group members were turned off by it as were tempted. You know vegans–we’re all different, and for every one disgusted by anything with the texture of meat there’s an equal number of us salivating over it. I have no problem with a meaty texture as long as no animal had to suffer for it, so I was immediately intrigued. The idea of jackfruit-infused ribs stuck with me even though I had forgotten which group I’d seen the photo in. (Thanks, Lacey, for reminding me!) So I had to make up my own recipe, using my much-loved Barbecued Seitan Ribz as a base. It took two attempts to get the texture just right, so my family has eaten a lot of barbecued ribs this week–and they are overjoyed! Homemade seitan is a rare treat in our house, and we devour even double batches of ribs as quickly as I can bake them. Since adding jackfruit to my basic BBQ ribs recipe requires an additional cooking step, I saved a little time and bother by making them totally in the oven–no need to get out the grill. And because jackfruit adds so much tenderness, I was able to skip the nut butter, so there is no added fat in these ribs, yet they’re a little more filling than basic ribs. Watch my quick video to see how easy they are to make. These tender ribs make the best barbecue sandwiches ever! Heat a non-stick pan over medium-high heat. Add the rinsed jackfruit, 1/4 cup barbecue sauce, and 1/4 cup water. Lower heat, cover and simmer, stirring every few minutes and mashing jackfruit with a spatula or fork, until jackfruit is tender about 10 minutes. Remove cover and mash jackfruit, allowing water to evaporate. If any large or tough pieces of jackfruit remain, put them on a cutting board and chop with a knife. Allow the jackfruit to cool completely. Preheat oven to 375F. Oil a 8x8 or 9x9-inch Pyrex baking dish. Combine the vital wheat gluten and all the dry ingredients in a large mixing bowl and stir well. Add the water, soy sauce, and cooled jackfruit. Stir or knead well until all ingredients are evenly distributed and all wheat gluten is absorbed. If there is not enough moisture, add one or two tablespoons of water, no more. Spread the mixture evenly in the prepared baking pan. Bake for 30 minutes. Remove from oven. Use a knife to loosen the seitan along the edges of the pan. Spread barbecue sauce evenly over the top and flip over in the pan. (It's easiest to do this if you divide the seitan in half first and flip one half at a time.) Coat the top with barbecue sauce and return to the oven. Bake for 15-20 more minutes, until ribs are firm and cooked in the middle but not hardening along the edges. Cut into 16 "ribs" and serve with additional barbecue sauce. Make sure you buy young green jackfruit in water or brine, not sweetened jackfruit. You can find it in 20-ounce cans in Asian grocery stores for about $1.50 per can. I find that a 20-ounce can yields 10 ounces of jackfruit once it is drained. Brands of jackfruit vary. Some can contain pieces that are tougher than others and may require additional cooking time or even chopping with a knife. Of the brands I've tried, I have found Chaokoh to have the most tender jackfruit. *Calories, sugar, sodium, as well as other nutritional data will depend on the exact brand of barbecue sauce used. Happy Fourth of July to those who celebrate it! Made these for the second time. Delicious the first time, but the jackfruit brand I got is pretty tough. This time I soaked and rinsed the jackfruit, drained and pulsed in the food processor. Followed the rest of the recipe as written (used parchment to make it easier to flip). So very good! I don’t have smoked salt. Can I add a bit of liquid smoke & use regular salt instead? Liquid smoke will be fine. You don’t really need to add additional salt unless you want to. Sweet. Thanks! This recipe has been making the rounds on all my vegan FB groups. Can’t wait to try tonight! I made these and my husband and I devoured them. They were even better the next night sandwiched in hamburger buns with Chao cheese, extra bbq sauce and pickles. Thank you for sharing this easy yet delicious recipe! do you have to remove the seeds of the jackfruit first? Some people remove them. I don’t but they don’t seem as tough in the brand I buy. I made these last night, with addition of 2 tbsp peanut butter (for fattiness, since my diet is not low-fat) and they’re AMAZING! Thank you! Had you made them without the peanut butter first?